Contact us for pricing and all of your API sourcing needs! 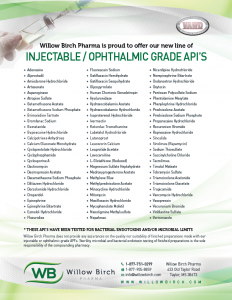 Willow Birch Pharma is a leading FDA-Registered / VAWD Accredited supplier of Active Pharmaceutical Ingredients (API’s) to the US Compounding Industry. 2019 © Copyright - Willow Birch Pharma, Inc.